Bo Jackson was the first athlete to be named an All-Star in two major American sports and he won the Heisman Trophy in 1985. In 1989 and 1990, Jackson's name became known beyond just sports fans through the "Bo Knows" advertising campaign, a series of advertisements by Nike, that starred Jackson alongside Rock and Roll Hall of Fame musician, Bo Diddley, promoting a cross-training athletic shoe named for Jackson. 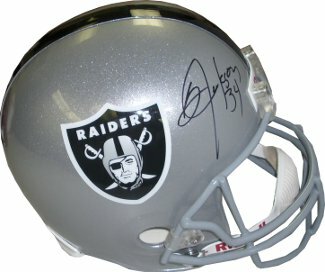 Bo Jackson has hand signed this Oakland Raiders Full Size Replica Helmet. Jackson Hologram and Certificate of Authenticity from Athlon. This Genuine Licensed NFL Full Size Helmet Display Case Is Wall Mountable. Frame Is Available In Your Choice Of Wood, Mahogany, Or Black Finish. Inside dimensions are: 14 1/2" Width, 10 1/2" Depth, 11 1/2" Height. Overall dimensions are: 20" Width, 11 5/8" Depth, 11 1/2" Height. This Is The Most Popular Of All Of Our Football Helmet Cases. The Base Is Black Acrylic And Gold Risers. A Mirrored Back Comes Standard On This Case. A Matching Nameplate Is Included With Your Order.